Alice Jackson, 55, was poised to spend Christmas inside a Multnomah County jail cell following her arrest on Nov. 24. Jackson, who has bipolar disorder and depression, said not taking the prescribed medication for her mental illnesses contributed to her arrest. Her husband called police when an argument between the two became violent, although she said his intent was never to have her arrested. Portland Police Bureau was not able to provide details from the police report by press time. As she faced a misdemeanor domestic violence assault charge, all that stood between Jackson and her release was $500 for bail. But Jackson and her husband survive on Social Security disability benefits. Five hundred dollars might as well have been $5 million. They didn’t have it. Nearly two weeks after she was booked into jail, Jackson got a phone call. She assumed it was her lawyer, she said, but the woman on the other end asked her if she’d like to be bailed out. “I thought it was a joke,” Jackson said. But it wasn’t. 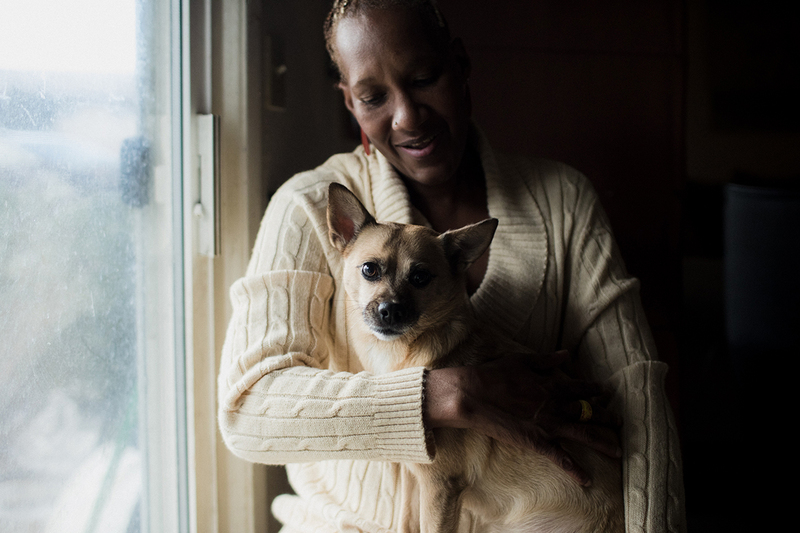 Thanks to local group Portland Freedom Fund, Jackson was able to spend Christmas with her family and cherished little dog, Baby, enjoying what she said was a “very nice” holiday at her apartment in deep Southeast Portland. Her next court date is scheduled for late February. Domestic violence cases are complex, can vary significantly from one another, and are impossible to generalize. But an examination of how Oregon’s bail system plays out in some of these cases illustrates how it’s a system that might not be achieving its goals: public safety, victims’ safety and court attendance. To Portland Freedom Fund, the charges a person is facing don’t matter when it considers whether to bail them out; defendants are presumed innocent. Instead, co-founder Amanda Trujillo said, it picks cases based on whether it can afford the bail, and it prioritizes people of color and those at a higher risk for being harmed inside the system, such as members of the LGBTQ+ community. “We just want everyone to have the same opportunities as someone who has money and has resources,” Trujillo said. The fund operates on the premise that people who haven’t been convicted of a crime shouldn’t be held in jail simply because they are poor. It’s a sentiment that’s been spreading throughout the country in recent years. The idea that bail is economically discriminatory, in combination with data that shows it isn’t necessarily effective in preventing failure to appear in court, has led to substantial reform in states such as California and New Jersey. According to The National Registry of Exonerations, tallied at University of Michigan, there have been 2,364 exonerations nationwide since 1989. Most, 96 percent, are overturned felony convictions because exonerations are expensive and time-consuming. And keeping people incarcerated while they await judgment on crimes they may not have committed can have negative long-term effects. After 24 to 48 hours in jail, “your life starts to unravel,” he said. A person’s incarceration can lead to loss of housing and employment, missed bills and medical appointments, and failure to meet responsibilities such as child care. Defendants are also more likely to plead guilty and more likely to be found guilty when they are held in jail during the court process, numerous studies have found, including a 2016 study of 420,000 cases published in the esteemed scholarly journal American Economic Review. As states across the country increasingly rethink their cash bail systems, Oregon is no exception. In 2017, Oregon Legislature created the Task Force on Public Safety and charged it with answering some key questions about Oregon’s criminal justice system, including what it would take to move away from cash bail. As it so happens, Oregon is in a better position to enact meaningful reform to its bail system than most states. For one, most other states have a bail bondsman industry that lobbies aggressively against bail reform, but the Oregon Supreme Court effectively eliminated that industry in Oregon with a 1978 court decision. Mike Schmidt, director of Oregon’s Criminal Justice Commission, said the 1978 ruling has contributed to many policymakers’ comfort with Oregon’s existing bail system – after all, it’s already been reformed. And, he said, his peers considering bail reform in other states have expressed envy over Oregon’s bondsman-free bail system. This is partly because there’s been substantial media coverage that’s exposed problems associated with having a for-profit industry attached to bringing people into court. But Oregon has the added bonus of being able to consider abolishing its bail system without a for-profit industry getting in the way. “From a reform perspective, not having a bail bond industry means that we can have this conversation in the absence of people who are financially motivated or economically motivated,” Schmidt said. Another reason Oregon could be better poised for reform is that it likely will not take an amendment to the state constitution to eliminate cash bail, as it would in many other states. While Schmidt emphasized this factor is yet to be confirmed by attorneys with the Oregon Department of Justice, preliminary findings of his commission suggest changes to state statutes may be all that’s needed. But this law is rarely used. But because the article exists, it means judges wouldn’t be left without a tool to protect the public from dangerous offenders in felony cases if Oregon moved away from cash bail. Collins sits on the Task Force on Public Safety and has a reputation as a statewide leader on bail reform. When he was the presiding judge in Yamhill County, he implemented the only release system in the state that pairs a risk assessment that’s been locally proven with the bail schedule. Essentially, his system requires judges to release defendants who are low risk and facing lesser charges without bail. “There’s not a lot of gray area,” he said. Some more serious crimes, such as a first charge of driving under the influence of intoxicants, are also required to be released without bail; however, the defendant will have to meet certain conditions, such as not consuming alcohol or entering bars. He said since implementing his system for pretrial release about six years ago, in conjunction with a system of automated telephone court-date reminders, a higher rate of defendants is showing up to scheduled court appearances. These policies also have reduced the percentage of people being held pretrial at Yamhill County Jail in McMinnville from 45 percent to 35 percent, according to Jessica Beach, director of the county’s community justice department. But before the Task Force on Public Safety makes any recommendations to the state legislature on Oregon’s bail system, it needs to understand how bail is being implemented in jails across the state, it indicated in a report it released in September. For the time being, it suggests Schmidt’s commission gather the data it needs to make informed recommendations. “I hear stories on both sides, where the bail money system fails,” Schmidt said. He said those stories range from people who aren’t posing a safety or flight risk but are being kept behind bars because they can’t afford bail, to those who pose significant risk being released because they can, such as the Saudi Arabian student who recently made headlines for being bailed out and then fleeing the country after a fatal hit-and-run. The Criminal Justice Commission is considering ways to gather the data it needs to answer those questions from Oregon’s 31 county and six municipal jails. Only nine Oregon counties have pretrial release programs, which would likely become necessary in a bail-free system. It’s likely some legislative changes to state bail statutes could be on the table as soon as 2021, Schmidt said. On Jan. 17, 1,046 inmates were being held in Multnomah County’s two jails, said Sgt. Brandon White, public information officer with the Multnomah County Sheriff’s Office. Of those, he said, 530 were being held pretrial, and the vast majority of those inmates were bail eligible. The sheriff’s department does not track the percentage of bail-eligible inmates that post bail. In Multnomah County, an automatic hold is placed on anyone charged with a domestic violence crime. This means that they cannot be released from jail on their own recognizance until a judge has reviewed their case. This is, in part, so that a judge can determine whether they pose a safety risk to the victim, and it can also allow for some time for the offender to cool off, said Chuck Sparks, who retired as Multnomah County chief deputy district attorney shortly after being interviewed for this story. But this only comes into play for defendants who can’t afford bail. Those who can are often released hours after being booked. Street Roots examined the length of stay for domestic violence offenders in Multnomah County last year and found that in July and August alone, 62 domestic violence offenders were released in less than 20 hours of booking. Eight of them were facing felony assault charges, and of those, four were out in less than eight hours. Of those charged with misdemeanor assault, 17 were out in less than five hours. David Bloom, a more extreme example, was booked July 19 on fourth-degree assault, harassment, strangulation, coercion and interfering with making a police report. He was out on bail within 2 1/2 hours of booking. Strangulation, at the time of his arrest, was a misdemeanor, but it has since been elevated to a felony because it has been shown that offenders who strangle are more likely to commit homicide later. Multnomah County uses a modified version of the Virginia Assessment when determining the potential risk of releasing jail inmates pretrial. It’s a series of eight questions used to score an inmate based on the number and severity of charges they’re facing, past convictions, history of drug use and other factors. While this assessment has proven effective in determining risk for some offender categories, it has not been proven for domestic violence. Senior Deputy District Attorney Traci Anderson said many domestic violence offenders score as low risk on this assessment, but that’s not an accurate picture of the danger they may actually pose to the survivor. In domestic violence, she said, “context is key.” And nationwide, there is a trend toward getting that context and assessing offenders for lethality in misdemeanor cases, she said. In Multnomah County, costs associated with pretrial incarceration can place significant pressure on policymakers to lower the jail population, but “that butts up against safety concerns,” Anderson said. She has compiled and distributed a domestic violence best-practices sheet that she encourages judges to consider before releasing domestic violence offenders. It lists lethality factors such as strangulation and child custody disputes and outlines victims’ rights, as well as release conditions in domestic violence cases. Sen. Bill Hansell (R-Athena) is sponsoring Senate Bill 309, which would require Oregon law enforcement to conduct an evidence-based lethality assessment on all people arrested for domestic violence, should it be passed into law during the 2019 legislative session. Further complicating release decisions on domestic violence cases is the quick turnaround between booking and the release hearing. In Multnomah County, it often takes place during arraignment on the day after the arrest. “In my experience, those police reports aren’t ready yet,” said Yazmin Wadia, an attorney at Oregon Crime Victims Law Center. She said the police report often contains information that could sway a release decision. Her center gets calls from victims worried about their safety upon the release of their attacker – either due to posting bail or sentence completion – several times each week. On the flip side, there are many situations where the victim wants the offender to be released, as was the case with Jackson. Because Portland Freedom Fund supplied the bail, she was able to spend her 25th wedding anniversary with her husband, watching movies, the day after Christmas. “They are a godsend,” she said of the fund’s volunteers. They took her to Popeye’s for red beans and rice after picking her up from jail and bought her a “real” full-sized Christmas tree along with lights and ornaments that she hung with her husband and niece, an annual family tradition, she said. Alice Jackson was bailed out of jail in time to enjoy Christmas with her family and her dog, Baby. In Oregon, a person can be released on bail if 10 percent of the total amount is paid as a deposit. In Jackson’s case, her bail was $5,000, so $500 was required to get her out of jail. If the defendant doesn’t show up for court, then the other 90 percent of the total amount is owed to the court by whoever posted the initial 10 percent. Since launching ahead of the national Black Mama’s Bail Out last spring, Portland Freedom Fund has spent close to $40,000 bailing out 18 people. It posts the bail amount to the defendant’s commissary so the inmate can self-bail, which prevents the fund from being liable for the other 90 percent of the total bail amount if the defendant doesn’t show up to court. If the defendant owes money for restitution, child support or unpaid court fines and fees, such as parking tickets, the state keeps the bail deposit rather than returning it upon the closure of the case. Losing that state revenue is an issue that’s come up during conversations around bail reform, but “that shouldn’t be the reason for requiring people to post bail,” Judge Collins said. The Portland Freedom Fund has bailed out two people facing attempted-murder charges, but most defendants were being held on minor charges such as trespassing and drug offenses, Trujillo said. Street Roots met with Jackson at her apartment, and she answered the door using a cane. She’s had a Baker’s cyst in her leg since before the arrest, and she moved about the apartment slowly. When asked if she felt like she posed a risk to public safety, she laughed.